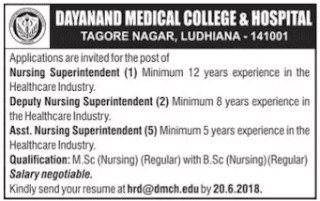 Dayanand Medical College and Hospital (DMCH), Ludhiana has given a notification of 08 Nursing Superintendent, Deputy Nursing Superintendent, and Assistant Nursing Superintendent Vacancies. The interested candidates can apply for the DMCH Ludhiana Recruitment 2018 on or before 20 June 2018. 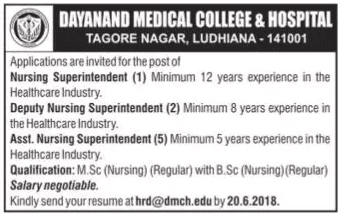 DMC Hospital Ludhiana Jobs 2018-19 notification is out. As per the Notification, there are 08 Nursing Superintendent, Deputy Nursing Superintendent, and Assistant Nursing Superintendent Posts. The educational qualification is M.Sc. (Nursing) with B.Sc. (Nursing). The age limit is as per the DMCH Ludhiana rules. If you are looking for Jobs in Ludhiana Hospitals then this article is going to be very helpful for you. The candidates should have passed the M.Sc. (Nursing) Regular with B.Sc. (Nursing) Regular. The candidates should have experience in healthcare industry. Experience: 12-years for Nursing Superintendent, 08-years for Deputy Nursing Superintendent and 05-years for Assistant Nursing Superintendent. As per the DMC Hospital norms. You can send your resume at hrd@dmch.edu on or before 20.06.2018. Last Dates: 20 June 2018. Dayanand Medical College and Hospital, Tagore Nagar, Ludhiana-141001.